Pope Benedict XVI is calling on the faithful to pray for China. Speaking at today’s General Audience, the Holy Father says because of restrictions and pressures on the Church by China’s communist government “Christ is living his passion” there. He says that Chinese Catholics want unity with the universal Church, and with the Successor of Peter. The Pontiff expressed his spiritual closeness to his brother bishops and faithful who face difficulties because of the practice of the faith. 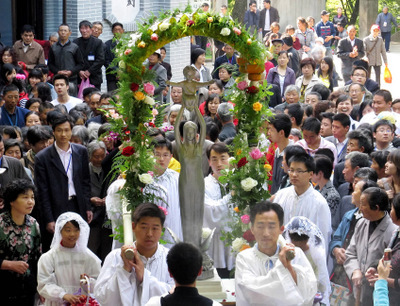 CNS/UCAN: A 2009 photo of Catholics carrying a statue of Mary as they process to the Sheshan Marian shrine in Shanghai, China.